Posted on Mon, Feb 27, 2012 : 12:42 p.m. The Michigan basketball team had one of its worst defensive outings of the season Saturday in a lopsided home loss to Purdue. And John Beilein is still trying to figure out why. "I may ask (the players) in film today," Beilein said Monday during the Big Ten coaches' teleconference. "It was just one of those days." 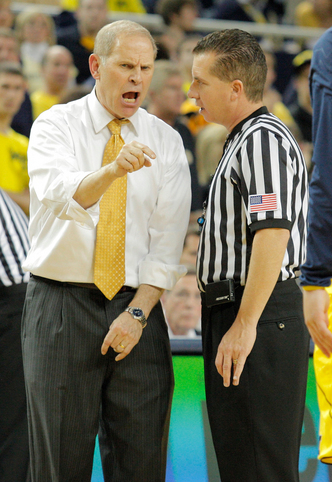 Michigan coach John Beilein argues a call with an official during the Wolverines' 75-62 loss to Purdue on Saturday. Beilein was also unhappy with his team's defensive performance. The Boilermakers shot 57.7 percent from the floor after halftime Saturday, and became the first team this season to score at least 75 points against Michigan at the Crisler Center in the 75-61 win. Beilein said plenty of his team's struggles had to do with communication issues, as well as Purdue's overall speed to the basket. "There were several communication breakdowns, which are uncharacteristic of a couple of people," Beilein said. "And they happened at such high speed, we were a bit delayed with what we were supposed to do. "They run their stuff very well and they're shooting at a very high rate from deep, and you have to be right in them." Most of Michigan's struggles in the second half came at, or around, the basket. Purdue was 7-for-10 on shots in the paint after the break, and went 13-for-23 from two-point range in the second half. Purdue guard Terone Johnson spent most of the evening beating defenders to the basket, going 9-for-12 from the floor, mostly on layups. Beilein said the performance was an opposite effort of what the team saw earlier in the week against Northwestern. "We didn't have a great defensive game, as far as recognizing, quickly, what we had to do," he said. "And what was surprising was that no one throws more tricks at you than Northwestern, and we were able to adapt to that so well. "We did not adapt as well (against Purdue)." After the game Saturday, Beilein discussed how Purdue's ability to defend Michigan freshman point guard Trey Burke on the ball screen was key to the Boilermakers' success. Beilein said Purdue aggressively played the ball screen with larger defenders, notably 6-foot-10 forward Robbie Hummel,, which hindered Burke's ability to find his way into the lane. After reviewing the film, Beilein explained that Purdue used both screen hedges and switches against Burke, something the freshman continues to work on fighting against. "That's basketball, and he's still learning every day," Beilein said. "There's hedges at all different angles. Wisconsin hedges very different than Purdue hedges, and teams switch ball screens much differently than they used to. Is it a hedge, or is it a switch? "Every game is going to be completely different, and as a result, we work on it endlessly to get him to work on those things. In the moment of action, he'll make a really great play or he'll make a play that he'll learn from in the days ahead. ... It's like a quarterback reading the blitz." Draymond Green (23) is Michigan State coach Tom Izzo's pick for Big Ten Player of the Year. Not surprisingly, Michigan State coach Tom Izzo offered up a public pitch for MSU senior forward Draymond Green for the league's player of the year award. Green is the only Big Ten player to average a double-double this season (15.6 ppg, 10.3 rpg). "If you look at what Draymond has done in a number of different areas," Izzo said, "there's times throughout the year, and even now, that we play through Draymond like he's a point guard. When you look at what he's done with steals, blocked shots, assists, scoring, rebounding and leadership (he's been solid). "He's going to get my vote, and I'm not sure that (would have) been the case earlier in the year. I think he's earned and deserved the accolades that he has a chance for." Michigan will travel to Illinois on Thursday (7 p.m., ESPN), and it may see a much different squad than it saw earlier this month in Ann Arbor. Illinois snapped a six-game losing skid with an 11-point home win over Iowa, giving maligned coach Bruce Weber and company something to smile about for the first time in nearly a month. "We had kind of a renewed energy and a renewed spirit and made more of a commitment on the defensive end," Weber said. "A week ago, we were still on the (NCAA Tournament board), and then we lost a couple more. But we still talk about it. We had to get one (win) before we could make it part of our dreams (again), or hopes and goals. "Now we've got one, and then we get a Michigan team that's really highly rated that could obviously be another marquee win to put on the resume." Tue, Feb 28, 2012 : 12:35 a.m.
@boo - on Green: Myron Medcalf from ESPN agrees with your assessment of Green. From today's news: &quot; Tom Izzo is certainly in the national coach of the year conversation. And Draymond Green is the Big Ten's player of the year. &quot; on Burke great performances this year. Freshman of the week something like 6 times. Cody Zeller was too, and has slightly better stats, though I'll be the first to say that its hard to compare stats when they play different positions and one is a foot taller. Very close call. If the tiebreaker is on impact, then Cody probably gets it based on how far Indiana has come from preseason predictions. If the tiebreaker is on final team ranking, it will go to Burke. Either way, two outstanding freshmen. Mon, Feb 27, 2012 : 8:01 p.m.
And yes Green is the player of the year in the Big Ten. Burke will be Freshman of year. Mon, Feb 27, 2012 : 8 p.m.
go get the victory at Illinois and prepare for the Big Ten tourney! Move on. Mon, Feb 27, 2012 : 6:37 p.m.
uh, how about rebounding?! I don't know what the comparison was in the last game, but remember a lot of 3 pt bombs, two and three players guarding and forcing shots and running down the court before the ball bounced off the rim. no inside game, the list goes on...........and, rumor last year that hardaway jr looking to go pro.......??!! he's one of the worst ones in the starting line up....... again, I say, maybe next year... GO BLUE!! Mon, Feb 27, 2012 : 6:25 p.m. It's pretty simple. The reason there are defensive lapses is because you've got 5 players on the floor who are all thinking about who's going to shoot the next 3 pointer. We are starting to see why Beilen's teams seem to hit a ceiling. It's because you can only go so far when you are totally dependent on the 3 pointer like this current team is. As far as Draymond Green goes, I think he is hands-down the Big Ten player of the year.